Hello world! I know it has been a hot minute since I’ve written a word. Life has been a whirlwind since I have been back at work for the school year. I feel like I have been on a fast-moving train and it has yet to come to a stop. You may be wondering how things have been going as a new Kenan Fellow taking back all I have learned to my classroom. The greatest change I can comment on is the change in myself. I have really stepped up my leadership role withing my school and I am working on making a greater impact in my county. Let me tell you… I am EXHAUSTED! But I have been inspired far more times than I have ever been before and that is worth all the extra work. I took on the role of Data Team Leader and I am a member of the School Improvement Team. I helped lead our Science Olympiad Team and I planned our 7th grade field trip to the NC Natural Science Museum in Raleigh this past fall. Had it not been for my work with Kenan Fellows I would not have been ambitious enough to think I could plan and lead a field trip so far away from our school. There many bumps in the planning stages but come day of, our trip went as smoothly, if not smoother, than I could have hoped. My students still bring up things they learned from the museum to this day. 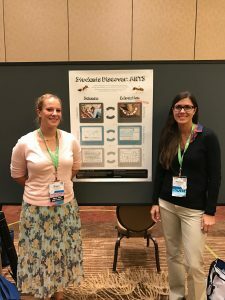 Even more exciting, at least for me :D, I presented a poster on our Students Discover projects with Dr. Sorger this past fall. I had never been to Denver before, let alone present a poster at a large conference! This was such a great experience and I am very thankful for it! I will be implementing Invisible Pathogens next week. There was a bit of hold-up in trying to get the materials necessary to complete the lesson. Now that I have the materials, I am ready to get started. I’m so excited about it! I know my students will love it. I will definitely get back to you on how it goes. I suppose it is time to get back to the daily grind and try not to worry too much about the changes NC is throwing at teachers. All I can say is that this is the first time in 7 years of teaching that I have heard so many teachers afraid of losing their jobs. It is already hard enough keeping teachers and now those willing to stay may lose their job… crazy times indeed.